A new technique developed by researchers at Rice University and Los Alamos National Laboratory can probe atom-thick materials to measure hydrogen production. The Rice lab uses an electron beam to drill sub-micron holes through an insulating layer of poly(methyl methacrylate) to probe specific areas of nanoscale flakes. Image: Jing Zhang/Rice University. Researchers at Rice University have taken a deep look into atom-thick catalysts that produce hydrogen to see precisely where it's coming from. Their findings could accelerate the development of two-dimensional (2D) materials for energy applications such as fuel cells. The Rice lab of materials scientist Jun Lou, together with colleagues at Los Alamos National Laboratory, developed a technique to probe catalysts through tiny ‘windows’ created by an electron beam. 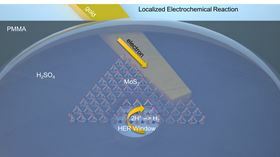 This allowed them to measure the catalytic activity of molybdenum disulfide, a 2D material that shows promise for applications that use electrocatalysis to extract hydrogen from water. Initial tests on two versions of the material proved that most production is coming from the thin sheets' edges. The researchers already knew that the edges of 2D materials are where the catalytic action is, said Lou, so any information that helps maximize it is valuable. They report their results in a paper in Advanced Materials. "We're using this new technology to identify the active sites that have been long-predicted by theory," explained Lou. "There was some indirect proof that the edge sites are always more active than the basal planes, but now we have direct proof." The probe-bearing microchips developed at Los Alamos and the method created by Lou and lead author Jing Zhang, a Rice postdoctoral researcher, open a pathway to fast screening of potential hydrogen evolution reaction candidates among 2D materials. "The majority of the material is on the surface, and you want that to be an active catalyst, rather than just the edge," Lou said. "If the reaction only happens at the edge, you lose the benefit of having all the surface area provided by a 2D geometry." The lab tested molybdenum disulfide flakes with crystalline structures known as ‘1T prime’ (or distorted octahedral) and 2H (trigonal prismatic). "They're basically the same material with the same chemical composition, but the positions of their atoms are different," Lou said. "1T prime is metallic and 2H is a semiconductor." Researchers had previously shown experimentally that the more conductive 1T prime was catalytic along its entire surface area, but the Rice study showed that this finding was not entirely accurate. "Our results showed the 1T prime edge is always more active than the basal plane. That was a new discovery," he said. After making the flakes via chemical vapor deposition, Zhang used an electron beam evaporation method to deposit electrodes on individual flakes. He then added an insulating layer of poly(methyl methacrylate), a transparent thermoplastic, and burned a pattern of ‘windows’ in the inert material with e-beam lithography. That allowed the researchers to probe both the edges and basal planes of the 2D material, or just specific edges, at sub-micron resolution. The 16 probes on the inch-square chip built at Los Alamos pulse energy into the flakes through the windows. When hydrogen is produced, it escapes as a gas but steals an electron from the material, creating a current that can be measured through the electrodes. Probes can be addressed individually or all at once, allowing researchers to get data for multiple sites on a single flake or from multiple flakes. Rapid testing will help the researchers alter their microscopic materials more efficiently to maximize the basal planes' catalytic activity. "Now there's incentive to utilize the strength of this material – its surface area – as a catalyst," Lou said. "This is going to be a very good screening technique to accelerate the development of 2D materials."